Do you remember those old cartoons when one of the characters would lean back with a cigar, ready to relax, and then when the cigar was lit....KABLOOEY!...it exploded because it was really a stick of dynamite? Oh, how we would chuckle!!!! 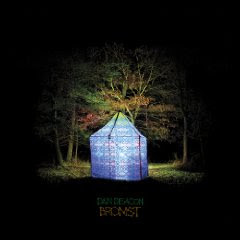 Well, while DAN DEACON's 2009 album Bromst isn't as dangerous as a stick of dynamite, it sure packs a surprising punch at almost every turn. Once you think you've got it all figured out, he'll hit you with another sucker punch that will pull you out of your element and surprise the dickens out of you. At it's heart, Bromst is an electronic album. Deacon's background includes plenty of off-kilter electronic experiments and that carries over onto this album. What separates this from his past work is the extensive use of real instruments which add more atmosphere and charm to the sometimes unsettling moments on the album. Unsettling? Did I just say 'unsettling'? Well, yes I did. But I don't really mean that in a negative sense. You see, Deacon's songs are filled with soaring, beautiful melodies that often get tangled up in a cacophony of strangeness and charm. There's nothing commercial about what he does, musically. In fact, if you're a fan of American Idol, I can pretty much guarantee that you will not appreciate what Deacon does... but you SHOULD! For every musical action he takes, there is an equal and opposite reaction that counteracts it. So, when I say that the melodies are lovely (and they are), there are most likely some loud buzzes and thwirps fading in and out of the mix that might distract the impatient listener from truly listening to the heart of the song. The heart of what Deacon does is what matters here. He challenges the listener to immerse themselves in the song, which is really what all musicians do. Sometimes, other musicians will coat the honey with rich milk chocolate and make it all go down so easy. No, not Dan Deacon. He offers you the honey, but you sometimes have to battle all the bees in the beehive in order to get your fill. This is not to say that Bromst is a difficult listen, because it is not. Bromst is so rich in layers that it's avant-garde, minimalist, melodic and noisy all at the same time, Strip away the layers and you've got at least five pretty decent albums here, but blended together, you've got a fine album that startles and entertains in equal measures. Apart from lovely little melodies floating about, there are nice vocal harmonies and chants that drift in and out of the songs like ghosts being channelled through ancient radio waves. In a way, Bromst sounds like a strange little mixture of The Residents, Of Montreal, LCD Soundsystem and Can. You can't really find obvious musical references to those bands, but the way that those acts create their own little musical world is very similar to what Deacon has done with this shimmering silver platter. So, sit back, relax and let me light that stick of....er... I mean, let me light your cigar! !